The school board faxed my flight itinerary and I read it carefully. I was flying from Sydney to Halifax, Halifax to Quebec City, Quebec City to Montreal, Montreal to Seven Islands, and Seven Islands to Schefferville. It sounded like a lot of flights to travel two provinces, but I thought it would be an adventure. The first two flights were quick and I didn’t have any difficulties. It wasn’t until I arrived in Quebec City that I experienced my first setback. I boarded the plane and sat quietly in my seat. The flight attendants began to make an announcement in French and the expressions on people’s faces made me worry. I heard some people gasp and others talk frantically with their companions. I attempted to ask the man next to me what was happening but he didn’t speak a word of English; either that, or he just didn’t want to speak to me. I started to panic and I jumped from my seat to talk to an attendant. “Excuse me. Is there a problem?” I asked the first attendant that I saw. “We are experiencing difficulty with the air pressure on the plane. We are going to move the passengers to another plane just as a precaution.” She placed her arm on my shoulder as she spoke and her voice was calm. I felt reassured and comforted. After 45-minutes of waiting, we were led onto another plane and I was back in my seat. I was officially going to miss my connecting flight, which meant that I missed all of my other flights that day. Connecting flights were arranged until I arrived in Seven Islands, but making my flight was the last of my worries when I arrived there. My flight number was announced and I approached the gate for Air Inuit. There were only three other people waiting at the gate and I worried about the size of the plane. The doors opened and I stepped outside. I felt like I was walking death row as I approached the plane. It was -51° C outside and the plane looked like it was used for cargo. There were a total of eight passenger seats and only three of them were filled. The five windows on the plane would provide a perfect view if the plane were to crash, which was all that was on my mind. I was starting to think that Schefferville was neither a top tourist destination nor a stopping point for any sane person. The spits and sputters of the plane were nerve racking, but they distracted me from thinking about just how far north I was traveling. I managed to focus long enough to glimpse out the window and I witnessed the northern lights. The brightly colored rays danced like beautiful ballerinas in the sky. I enjoyed nature’s free show and my body and mind began to relax. The colors and shapes created a new story like one I’ve never seen before. My time was consumed by the weaving and dancing of the lights and the plane ride quickly flashed before my eyes. I was traveling to a place beyond the northern lights and beyond my wildest imagination. This has to be a joke! This can’t really be happening. Is he serious? A caribou on the runway! Where am I going? “Do you want to see it?” The man next to me asked. “The caribou? Can you see it?” I foolishly replied. I leaned over and there it was. The caribou looked larger than the airport. Its long legs were stumps compared to its massive body. So we can’t land because there is a large caribou blocking the runway. It’s official; I am in the middle of nowhere. “Okay, it looks like we are clear to land,” the pilot announced happily. The plane landed about 50 feet from the airport and the door was pushed open by the pilot. The crisp, cold air filled my lungs and I coughed uncontrollably. 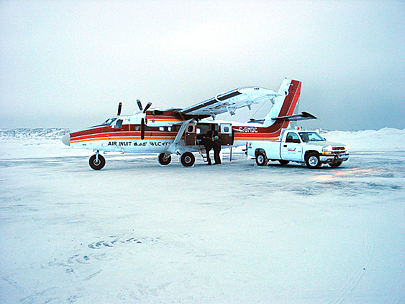 I was the first passenger to step off of the plane and my head instantly ached with the cold. I tried to hurry into the airport, but the temperature was taking my breath away. The school principal and vice-principal were both at the airport to greet me. I felt welcomed as they grabbed my bags and handed me a warmer jacket. “Nice to meet you,” the principal said as he took my bag. “I will be taking you and John will be taking your bags,” the principal said without giving me any time to reply. “I don’t think you understand,” replied the principal as he headed towards the door. I couldn’t take my own bags because they were there to pick me up on ski-doos. The drive to my house was a short 4km, but it seemed endless. The cold air burned my face and I had to keep moving my fingers just to make sure they were still there. The open land was dotted with a house here and there, but mostly I just saw snow and more snow. I couldn’t see a road beneath the snow, but they seemed to know where they were going. We arrived at my house and both men walked me to the door. “If you need anything, here’s my number. You have a phone right?” The principal was talking to me and I was trying hard to listen, but there was so much to take in all at once. “Thank you for everything,” I said as I stepped my new home. Before they were able to close the door, I dropped my bag to the floor and frantically searched for my phone. I hadn’t talked to my mother since I left and I needed to hear her voice. This was the most adventurous thing that I had ever done and I was, quite frankly, scared out of my mind. I unzipped the bag and haphazardly threw everything onto the floor. I found the phone at the bottom of the bag and I couldn’t pull it out fast enough. I crawled on my hands and knees searching for the phone jack. I finally found it and breathed a sigh of relief. I plugged the phone into the jack and waited for a dial tone that never came. My phone had not been hooked up. My hand began to tremble and tears formed in my eyes as I sat on the floor with the phone still in my hand. I was scared and alone and I couldn’t even talk to my mother. I began to feel cold and I thought it was just because I was so upset, but I quickly realized there was no heat in my house. Panic sunk in my chest and my breathing quickened. I hunted for the thermostat and turned it full blast. Kneeling by the radiator, I rubbed my hands together waiting for the heat, but it was useless and to no avail. Oh no! What am I going to do? My closest neighbour is 2km away and it is more than -50°C outside. Even if I did walk to a neighbour’s house, they speak Naskapi then French then English. I am going to freeze to death! This is crazy. Okay, I can do this! Just go into the bathroom and turn on the hot water. I can sleep on the floor in there if it is warm. In the bathroom, I closed the door to keep the heat inside. I turned the hot water on full blast and I waited for the heat. Once again, I rubbed my hands together and once again it was useless. I should have realized that if there was no heat there was no hot water, but I was in a state of panic. Finally, I tried the oven and it worked. The heat waves engulfed my fingers and they ached. I opened the oven and lay on the floor. That is where I spent the rest of my night. If anyone had of walked in, I am sure they would have thought I was trying to kill myself. My alarm clock went off at 5:30am. I had to change my clothes and clean myself up, but it was still cold and I still didn’t have hot water. As I warmed water on the stove, I felt like I stepped back in time. I quickly washed my face and brushed my teeth. The hot water felt sickening in my mouth and I resembled a pale comparison of myself when I looked in the mirror. “But you’re the bus driver,” I said rather rudely. The principal was at the door to greet the staff and students when I arrived. “Good morning,” he said as I walked into the building. “Sure. You can call from my office,” he replied. I walked into his office and picked up the phone. I could not manage to dial the number even though I had the same number for six years. After three attempts, I finally managed to hit the numbers in the right sequence. I was trying to avoid crying in the principal’s office on my first day of school. I just wanted to talk to my mother and tell her about everything that had happened to me. If I could just hear her comforting voice, I could make it through the day. “Oh… Ok….” my voice began to tremble. I burst into tears and began wailing into the phone. I’m sure my father thought I was being attacked by a wild animal because of the loud, piercing noises that I was making, but I could not muster up the words to explain the situation to him. I eventually resolved to hang up the phone. My face was red and wet from all of the tears. Other teachers walked by the office, but they didn’t say anything. They were all too familiar with the first day in Schefferville and they understood my anguish. I taught my classes that day to the best of my ability. I attempted to connect with the students by learning some Naskapi, but I only succeeded in learning curse words that I then proceeded to use on other teachers. “What is a lock down alarm?” I asked cautiously. “Well, let me show you,” she replied. I looked out the front window only to see a pack of wild wolves. The students and the staff had to wait in the building until the wolves dispersed. That was my breaking point. I realized that the school and the community were not for me. I stayed for the next 10 days and things did get better, but when the plane hit the runway, I felt better than if I won the lotto. 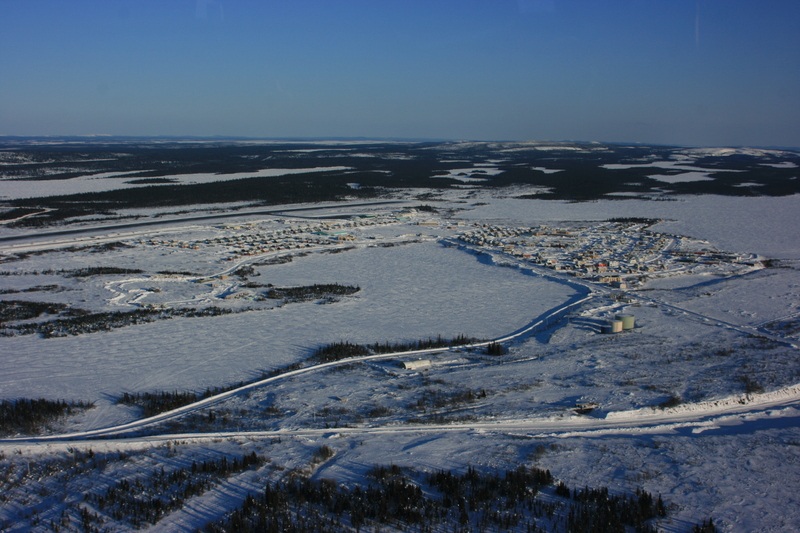 Schefferville changed my outlook on life. 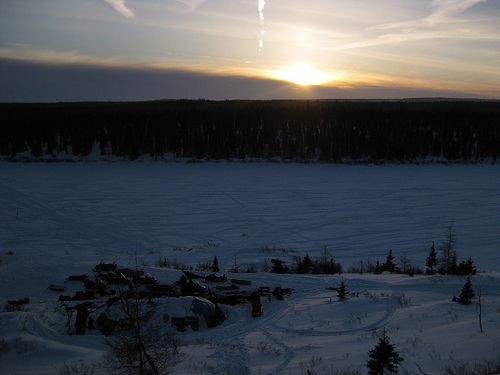 Even when I am in the most remote situations in Nova Scotia, I will never feel as isolated or as alone as I felt that first night in Schefferville. This entry was posted in Travel, Uncategorized and tagged adventure, Canada, eastern Canada, Family, first day, landscape, life, north, photo, Quebec, teacher, teaching, travel by lesleycarter. Bookmark the permalink. I enjoyed this so much….hmmmmmm….is that nice to say? Hey Lesley, there is no question, you need a thick skin to work in Schefferville. I worked at JSMS for 4 years as the French teacher, in fact I think I was working there when you might have dropped in, however I do not remember you at all. The solitude is a shock at first, but the innocence and humor of the students make it all worth while. Then you have the absolute beauty of the area, the friendliness of the people, the absolute silence. I would have loved to have seen a pack of wolves fighting while I was up there, not to mention a real Cariboo close up. Sadly both I only saw from far. Yes, there are major concerns and problems, but they do their best with the few resources they have available. Did I mention the fishing? The fishing up there is fantastic, and the hunting is nothing to sneeze at either! I think it would be a good exercise for every young Canadian, to spend at least 1 year living in the north, to truly appreciate the beauty and variety of our land and culture. And of course appreciate everything they take for granted back home. Yes, the school could have done a better job to welcome you in the new community, however as you stated, sometimes you have to make your own way and rely on your own wits to get by. Plus, if you have a good staff, you usually end up meeting some really awesome travelers up there and become part of a tightly-knit community. Yes I remember my early days of teaching. i never quite got to any remote part of Australia but i did a few years in Rockhampton which was about 7 to ten hours drive from my home on the Gold Coast. later I worked overseas in Japan and the UK and in those places I often felt like a stranger in a strange land.Your story about the wilds of Canada was excellent and vividly shows the sheer adventurism that comes with some teaching posts. After reading about your journey, I must admit I don’t think I would ever want to become a teacher. Glad you made it okay non the less, and it made for a great story. Thanks Nancy. I may have a history of bad first days, but the rest of the time made up for it and left me wanting more. It is an amazingly rewarding career. Crikey Lesley, that really IS extreme… Good for you for being brave enough to stick it out for 10 days. I was terribly disappointed in myself and felt like a failure as a teacher and in general. It took me a long time to realize that I was brave for trying and going to such a remote, uncharted tundra. I don’t regret my experience there and it shaped many of my decisions after. Sometimes it is our biggest mistakes that make us the strongest. Heck, after that, I felt like I could go anywhere because I always felt like it couldn’t be that bad. Wow! Having been to NT, I can appreciate the coldness of -56C and the wind which blows across the north. I can actually feel the bitterness of the cold while reading your post. Thanks for sharing your experience. Wow what a story! Enjoyed it a lot, but could also feel the desparation and cold through your words. Beautiful.. It sounds as if the people who hired you were not necessary thinking of how best to help you get used to all of these novitas, in fact who ever hired you must have known you would have needed a helping hand for at least the first 48 hours. (I mean I bet they go through teachers like wild wolves go through a lone rabbit!) I read it thinking ” wow what a great experience and/or adventure.” I would have loved to have tried it myself !! Would you accept it now, a little older and a little wiser, if you had the offer? Now that I have experience, I wouldn’t need to take such an offer. I did, however, go just as far north in a different province in September of the following school year. I loved my second teaching journey and stayed in that remote community for two years. What it came down to was inexperience, little support, and an extreme language barrier. Plus, it was the first time I had experienced such isolation. I don’t blame anyone else for my decision to go there, but I also do not regret my decision to leave. Wow! Amazing story. I have never been father north than Ontario province when I was eleven or twelve. Your pictures are also great and really convey the sense of isolation. Good Post! I just read this to my husband. We were laughing but at the same time feeling so sorry for you. 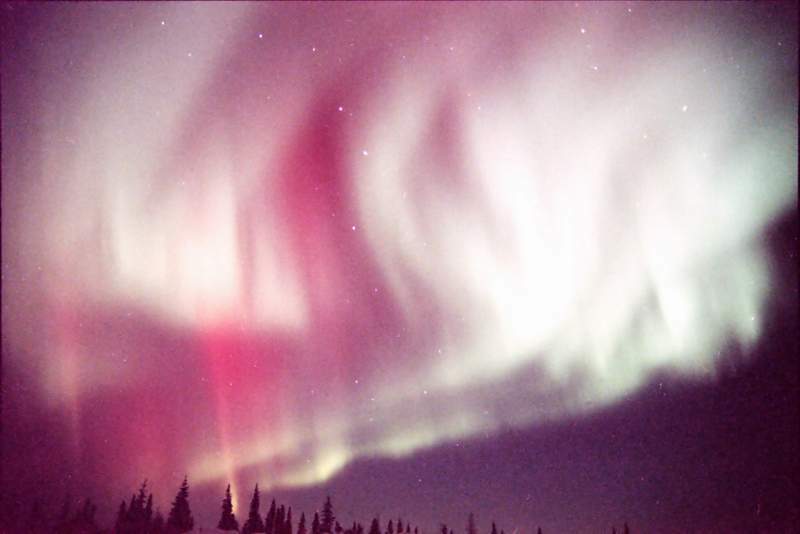 The Northern Lights were so beautiful, thank goodness for them. Thanks for sharing this story with us. Wow! 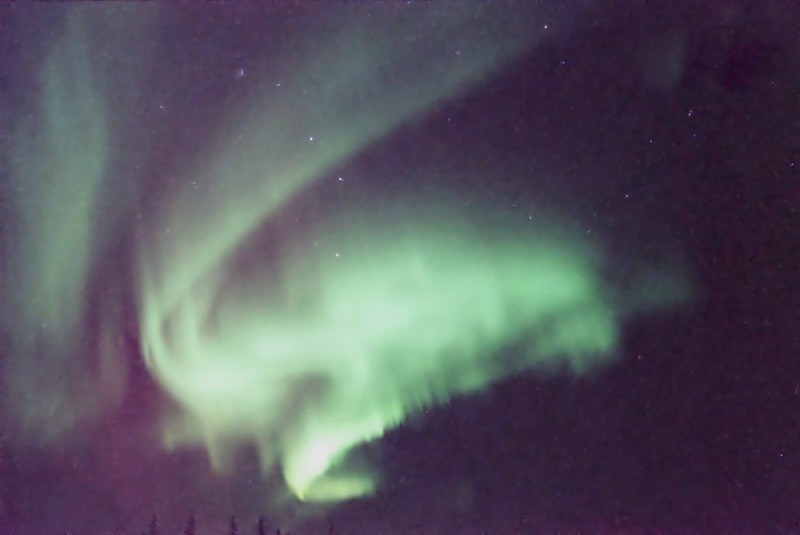 Quite the adventure…and I LOVED the photographs of the Northern Lights! Thanks for sharing your story! it’s hard to feel scared about taking a risk after reading about your experience. I remember my first day in front of a classroom, but it was in the middle of Chicago. All I had to face were my own demons – there was a support network. My heart goes out to how you felt when you couldn’t reach your mom on the phone! That was the most overwhelming part. I never felt so alone and isolated in my life. I always knew I could do anything as long as I had the support and encouragement of my family, but without them I felt lost. It may have been a short time, but I learned a lot. Your story hit home. Thanks for sharing. I’m a creature of sun. No sun, no smile. No smile, no joy. No joy, no energy. And I can go on and on forever telling you what the sun means to me. And yet ironically (as if God wanted to play tricks on me) I was born in Romania where the sky is grey for about 6 months starting in late September until end of March sometime even dragging it later into April. Snow seems to never end and freezing temperature take over, transforming everything into dirty ice and the country of hunched people. Needless to say I used to be miserable this entire period, waking up with a cold ache in my body that wouldn’t leave an entire day. I had no where to go, unless I was willing to leave behind everyone I knew and loved, everything I was accustomed to and learned my whole life. 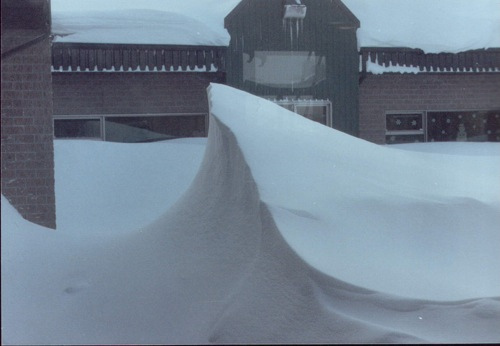 I remember my breaking point in December of 2002 when one morning I woke to look out the window and I couldn’t see 3/4 of my car. It was buried in snow. I took a shovel and went downstairs and began digging my car out–time was ticking and I had to take my son to school then make it to my office. Shoveling snow all around the car, my fingers ached so bad I thought it’s only a matter of time until they’d fall. I finally managed to dig out my car and tried to unlock it, but to no avail–the locks were frozen. At this point I was sweaty, hair sticking to my scalp, and mad as a pack of coyotes attacking their prey. Nine months later I moved to Arizona. I now live in California and I appreciate the sun and beautiful weather daily. Even after over a year of living here, I still look around in awe. Enjoy Arizona and keep your family close through email, phone, visits and every other way possible. You seem like the perfect person to submit a bucket list to Bucket List Publications. Do you have one? I’d love to share it on my magazine. Having fished extensively from Lac Mistassini through the Rupert River system to the James Bay Frontier, I’ve actually rested up and gathered provisions in Shefferville! A quaint and friendly (to us, anyways) town, a little out of the way for a supply run though! Mind you, we always went just after ice-out (first week of August), but loved the place. Welcome to Quebec, now you now why you got the job…. Nobody here wants to go there! I hope you did not get there during winter time…. I did have some experiences over there! I really enjoyed this post Lesley, you managed to capture your experiences well. I especially liked the little bits of dialogue that really gave the story life! I loved this post! I didn’t know you taught. Do you still teach? This is my fourth year teaching and I made a similar, but not quite as adventurous, move, to teach in central Florida last year. Totally random. My principal was sure I was going to run away because it is in the middle of nowhere, too hot, etc… But I have loved it! But I have loved my new home. Still, I can really relate to your story and the excitement of going to a new place. Thanks for sharing. I taught for 8 years, but when I moved to California I couldn’t get a work visa to teach. I miss teaching dearly but at 8 months pregnant I’m happy to be home. I will continue being a stay-at-home mom until my daughter is at least school age and we’ll see from there. Although this first teaching experience didn’t work out, I taught in equally remote places afterwords and thoroughly loved the journey. I was in northern Manitoba for two years, Nova Scotia for three years, and New Brunswick for three years. I also taught in various countries at summer camps and volunteer ventures. What do you teach? What grades do you teach? Wow. I have lots of teacher friends, but none of them has told me a story quite like this one. You poor thing! (And I can’t imagine how much worse your other first day stories can get!) Some jobs seem like you’re faced with predators, but real wild wolves really take the cake. It’s funny that you use the word “predators”. Stay tuned for my next “first day”. And if this was the THIRD worst, I can't wait to read about the second and the first! Stay tuned for two and one. Great story. Enjoyed it very much. By the way, I’d argue that the humans are the predators, not beautiful wolves 🙂 At least in the US. . .
Watch for my next post where a human is somewhat the predator… and more intimidating than the wolves. Not surprised. We are a questionable species most of the time! 🙂 Excited. And wow, you have had quite a life so far, girl! Quite an adventure. Thanks for sharing it. Wow and I thought it got cold here but nothing compared to that. I remember visiting Nashville and it was 72 degrees and sunny. Flew to O’Hare and the temp was -10 and windchill of -40 with snow coming down. Seemed like weeks before I warmed up. With no heat on your first night it must have felt like the last straw. Glad to hear about the oven. Great post- what an experience! All I heard was -50, -56, no hot water! I will never complain about it being above 0 again! Id feel invincible in the rest of the world after that trip! I would have flown straight to the equator! Lesley, I cannot believe you were ever dismayed by stuff like this! YOU????Nah!!!!!! Seriously, the extreme cold with no heat would have really gotten me, even though traveling by skidoos and caribous on the runway and no phone hookup would have only excited me. We had NO PHONE in our house in rural Mississippi until 1959. I was in the sixth grade at the time. Thank you for sharing so unsparingly of yourself about your first teach assignment! Absolutely amazing story, and easily the most fascinating thing that I’ve read today! Great stuff! W.O.W! Negative 50. Yikes! I’m glad you survived. Lock downs in most schools are because of gun-wielding crazed teens…but you probably had to carry there just to keep safe from the wolves and bears. Hmmm, reminds me of the road trip to Dallas; discovered I left my cell phone in Chicago an hour into the drive, had to double back, flat tire on lonely stretch of road, property managers office closed so no key to get in, musty hotel room for the night, next day unpacking in80 degree F temps and no AC. But things smoothed out and I’m still here! Thanks for the read. Wow, Im a teacher too and I would have cracked as well! After the Caribou incident I would have just stayed on the plane and told the pilot to take me back. Lol. That’s one crazy story, though. Wow, you don’t do dull do you? My minus 16 with one radiator out of three in Sweden seems pretty tame. And I didn’t see the Northern Lights. I’m told the Swedes have a saying, “There’s no such thing as bad weather, only bad clothes!” Personally I’d be happy to skip the -56 mullarkey. 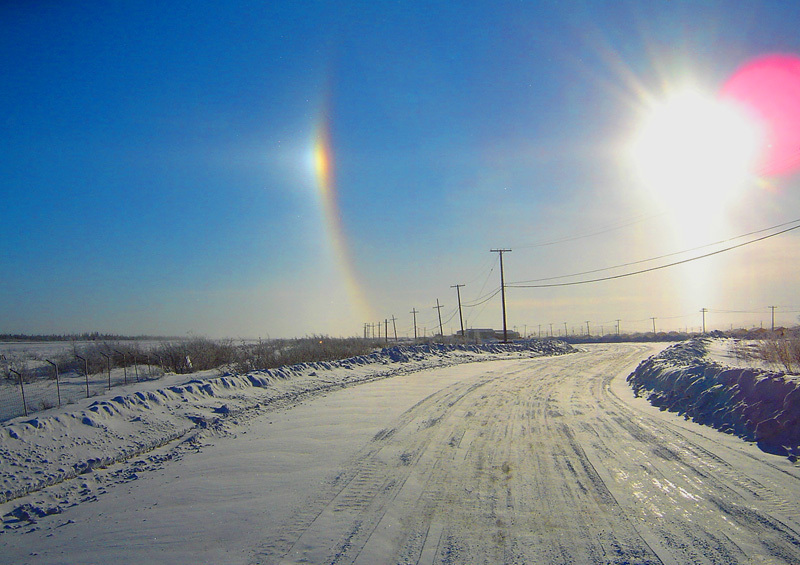 I grew up on the Canadian prairies, my father worked in Churchill, Manitoba for a time. He came back with stories of polar bears ripping up tents and stealing food and showed us how to build an igloo. In my 20’s I moved to Toronto and hated it. So I brought my kids to Regina for a year to experience the area. You never forget the wind freezing your face and neither will they. And it made them that much wiser! Ever watch the movie “Why Shoot the Teacher”? It captures it all! My next teaching experience may be even a little closer to home for you. I’ve only spend a few short days in BC but it was beautiful. I’m a Canadian myself, but from the east. I loved growing up in Nova Scotia and I hope to return, for visits, regularly. California, with all of its beauty, sunshine, and opportunity, will hopefully be my home for years to come. Thanks for reading and taking the time to comment; it’s greatly appreciated. My heart goes out to you. I thought substituting with older teenagers was an experience. Like others have said, I feel the cold. A pack of wolves! Wow. That is intense. It is hard for me to imagine that cold since I live in a place that experiences only two or three months of what I understand is winter. Ok, I would never have guessed a lock down for wolves! Where I came from it was lock down for gangs 🙂 Can’t wait to read the next experience…sure to be a doosey! After having read some of your earlier blogs, Leslie, I wouldn’t think you knew the meaning of the word fear. You must have been young because you seem to be such a daredevil(ette) now. LOL. You tell a story very well. I’m glad to didn’t freeze to death, but at least you did get to see the Northern lights. There is truly a silver lining to every story. I don’t blame you for getting out of there! Hi Lesley! Thanks for reading my blog 🙂 I clicked back on your blog, and I am loving it! Great post, and amazing pics. Thank you for your story, Lesley. For my part, I’d take the pack of wolves rather than the cold. I was desperate and shivering with you. I love my sunny warm climes in aussieland. Wow! And I thought my first day of teaching in South Arkansas was bad! I didn’t realize how lucky I was, no wolf lock-downs, no sub-zero temps! Great story, I felt the cold, your skidoo ride, the warmth of the oven and the joy of being back in the real world. What a way to start a career in education! I used to have nightmares about my classes when I taught (even though I really loved teaching), but nothing as bad as this. I’m a little apprehensive to read the next two if they are going to get progressively worse. Thanks for sharing your stories and I love the title and direction you are taking your work. This writing is amazing. You took me with you, during every scene change. I wanted more! Bravo and welcome home! I love this story and this makes our life worth living. I remember that feeling – just wanting to phone home & not being able to. Not being in control, being completely out of depth. It’s scary, but character building in the long term. Good post Lesley!